Are you looking for a heavy-duty pickup truck? If so, what features do you want? At C.H. Urness Motor Company, our team keeps our consumers up-to-date about the features that come with our models. The Ram 3500 is a popular heavy-duty truck that is equipped with numerous features. Read further to learn about a few of its exterior features. 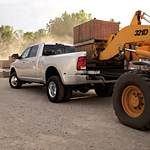 You can choose available wheel-to-wheel side steps with the Ram 3500. These steps let you access the bed of the truck with ease, and they also have a tubular shape that helps increase aerodynamics for improved performance efficiency. The RamBox Cargo Management System is also offered with the Ram 3500. This system includes a cargo box that is secure, lit, drainable, and durable. You can even remotely lock and unlock the cargo box when you choose the AllSecure Central Locking System. The RamBox Cargo Management System also comes with LED bed lighting, a truck bed divider/extender, a cargo-view camera, and more.